Lt. Col. Thursday (Henry Fonda) is being sent to Cavalry outpost Fort Apache in the dead of the Southwest Desert with his teenage daughter, Philadelphia (Shirley Temple). He’s to become commanding officer of the post, but rather than feeling honored with the responsibility, Thursday feels like he’s being punished with obscurity. He arrives to find that Fort Apache is a small, tight-knit post that has found a way to bloom where they were planted, even the arid desert near the border. 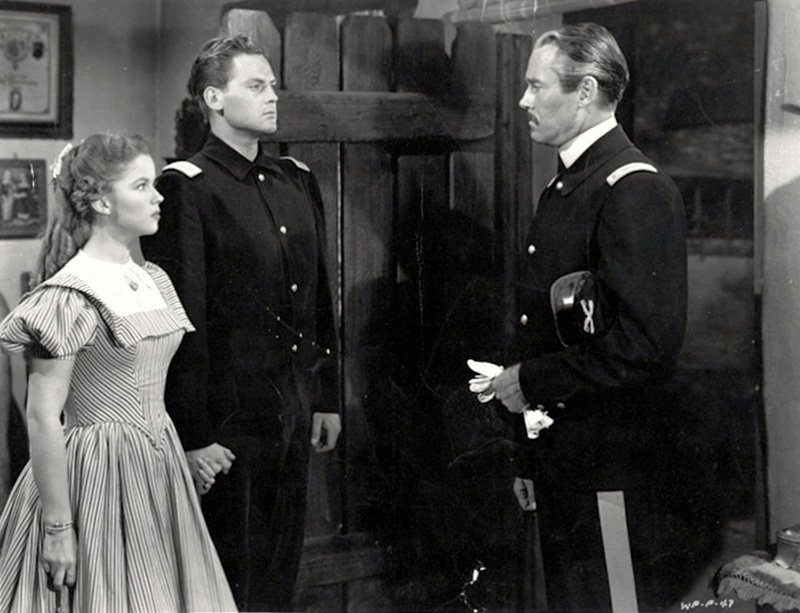 Once at Fort Apache, Philadelphia meets Lt. Michael O’Rourke (John Agar, Shirley Temple’s real-life husband), freshly arrived from West Point. This is Philadelphia’s first experience with Army life, having just left boarding school. And this is Philadelphia’s first chance to be around soldiers who aren’t her father or father figures to her. Of course it’s love at first sight between the two. Unfortunately, Col. Thursday has no desire for his daughter to get mixed up with anyone at Fort Apache. Adding more complications, O’Rourke’s father (Ward Bond, amazing as always) is Sergeant Major of the post, and while O’Rourke himself is a Lieutenant, his father being an NCO, even the Senior NCO of the post, is too high a hurdle for Col. Thursday to overcome. While Philadelphia and Michael’s relationship has its own challenges, Col. Thursday and Fort Apache have to deal with difficulties involving the nearby Indian Reservation. A tribe of Apaches has gone on the warpath, and Thursday sees his opportunity to make a name for himself in the history books. Captain York (John Wayne) tries to explain the political lay of the land to Col. Thursday, explaining that the Apaches are trying to find a way to live alone, in peace, and that the ones attacking their troops are acting independently. Most of the Apaches trying to make their way across the border are wanting to find a way to preserve their people. Thursday hears none of this and only sees the opportunity for a major military victory that will get him the notoriety he needs to get out of Fort Apache and to a more prestigious assignment. His officers and NCOs try to convince him that he is in over his head and taking on an adversary that far outstrips him, but to no avail. Finally he leads them all against the Apaches, and Philadelphia and the rest of the families are left waiting back at Fort Apache, not knowing if any of their soldiers will survive. One reason I love this movie is I relate to it on several levels. There are definitely a couple of people who come to mind when I watch Col. Thursday bluster his way around an established outpost, complaining that troopers riding through the desert aren’t in full regimentals but rather in modified “field uniforms.” Part of Thursday’s irascibility is due to the fact that the War Between the States had only recently ended, and in the movie the combined Union and Confederate armies had been reconstituted so that few military leaders maintained the same ranks they did before. For example, Thursday was a General in the Union Army, but is now a Lt. Colonel. Many officers from the South were brought into the US Army, then demoted to enlisted ranks. We see an understandable restlessness from a few of the characters, but most have accepted their new careers and intend to make the best of them. Not Col. Thursday. Also the premise of being sent to an outpost in the middle of the desert, against your wishes, and being faced with the decision to either whine about it or embrace it is all too familiar. The families at Fort Apache weren’t sent there for 2 or 3 years, they were sent there until they could justify and wrangle a transfer elsewhere, which could be 5, 10, 15 years. You really have to decide to bloom where you’re planted, even in the desert. One of the frequent criticisms with old Westerns is that Indians are always portrayed as mindless bloodthirsty savages. I’ve always found John Ford’s Westerns to break that stereotype, and “Fort Apache” is no exception. He displays the relationship between the Cavalry and the Apache leaders with nuance. No one is solely in the wrong, no one is solely in the right. It’s a bunch of humans doing what humans do, surviving. I can agree with positions both sides present, and I get incredibly frustrated with both sides, too. Chock full of John Ford alumni, “Fort Apache” is a wonderful showcase of talent. I have to start with Ward Bond, who plays Sergeant Major O’Rourke. Ward Bond will always be one of my favorites. He has a commanding presence but a gentle spirit. Of course, Ward Bond has to accompany John Wayne, and he does. I don’t think of this as a “John Wayne movie” because he is a central character but not the lead. Even so, he is his fantastic self. I’ve yet to see Henry Fonda do ANYTHING I don’t love, and Shirley Temple is adorable, simply adorable. There’s also Victor McLaglen, Pedro Armendariz, Guy Kibbee, Anna Lee and Hand Worden, among many others. “Fort Apache” will be on TCM on Tuesday, April 23 at 12:45 pm CST. I'm so glad that somebody other than me watches the old John Wayne movies--Fort Apache is one of my favorites.